"Necessity is the father of invention"
That seems to be the credo of Julie Bennett of Urban Xchange who is putting on a fashion show to help raise money to save The Helm. Yet, the event looks to be much more. by AngelaJossy on 7/3/2008 @ 8:37am Trish and I will be there (as volunteers) welcoming you at the front counter. by Erik on 7/3/2008 @ 10:43am Trish and I will be there (as volunteers) welcoming you at the front counter. by Erik on 7/5/2008 @ 11:35am The fashion show and event is tonight (Saturday) at 8:00 p.m.! One picture showing so much fashion. by escaping slave on 7/5/2008 @ 12:57pm Supporting the Helm sounds like a great cause. Too bad politicians like Norm Dicks don't support true small businesses like the Helm. Did anyone send him an invitation? by NineInchNachos on 7/5/2008 @ 3:30pm I'm going to try and make it. will the tacoma dome posters be for sale here? 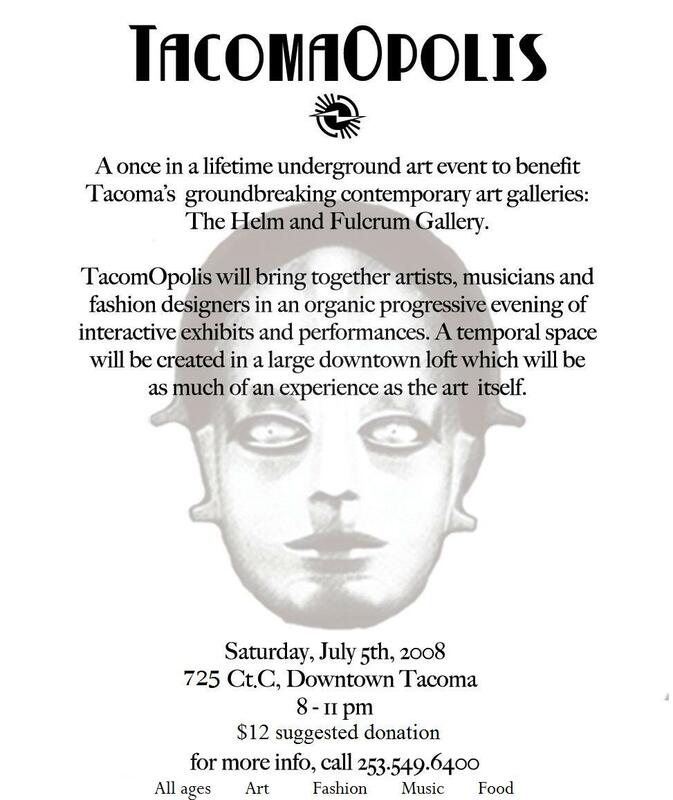 by Erik on 7/6/2008 @ 12:38am will the tacoma dome posters be for sale here? Master and Commander of the Tacoma Downtown Merchants Group was there. Laura Hannan checked out Andrea Trenbeath's jewelry. Laura and Tressie from Funkoma Vintage buried the hatchet and bonded. by NineInchNachos on 7/6/2008 @ 3:23pm Well it looks like folks had a good time. by izenmania on 7/7/2008 @ 10:56am That picture of Patricia is... kind of terrifying.